In a recent quest for inspiration, I found myself revisiting PBS’s Art21 series. I was pleasantly surprised by the interview with Bruce Nauman, particularly a brief segment regarding his Staircase project for the Oliver Collection in Northern California. 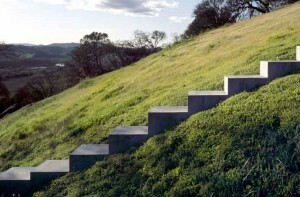 The piece is an installation of a staircase built into the hillside of a private property. 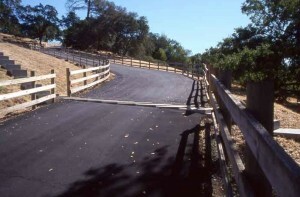 While each step’s tread is a regular 30 inches deep, the rise of each varies according to the landscape, requiring the participant’s strict attention to their movement. Nauman describes his intent to prevent a rhythm, in the hopes that the participant becomes exactly that, a body that actively participates with the work, and as a result, becomes more conscious of their physical self. The point was to make it not comfortable, which I understand as not discomfort per se, but instead an acute awareness. I liken this to the rather awkward in-between-projects phase I currently find myself in. It was a comforting reminder that it is indeed in the pauses between the rush of projects that one should pay attention. For it is in these moments, between the ups and downs, where one can clarify thoughts, gather strength, and move forward through the intention of the next step. Hillary Wiedemann is an artist who lives and works in Oakland, CA.